If you are a parent then you understand that finding a movie that your kids like and that isn't a complete waste can be hard. I love watching kid movies that teach life lessons with my girls. This month I wanted to focus on unselfishness and sensitivity since those are the values we are focusing on in the month of October. 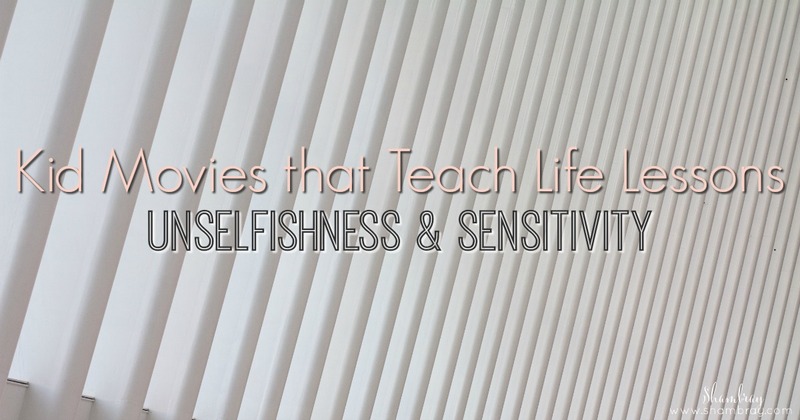 However, I had a hard time finding some movies that fit those values. Sad...I know. I found some, but they aren't entirely attention grabbing movies for little kids. There is one that is great for kids and the other two might be better for older kids. Each of them are fantastic movies though. This one is the great one of younger kids. 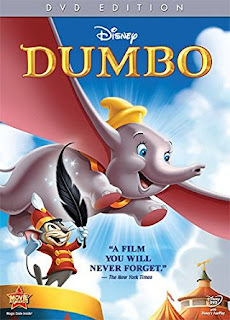 We all know the story of Dumbo. Poor Dumbo was laughed at and made fun of so often. This is a great way to talk about Dumbo's feelings and how the animals weren't being sensitive to him. 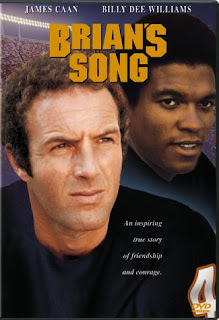 I had not heard of this movie until one of my friends suggested I watch it when I told her about my quest of finding a good movie that fit these two values. It is such a great movie about sensitivity. This movie shows how wonderful this world would be if we could all just be a little more sensitive to each other. I remember watching this movie in high school. It was so powerful to me back then. I wanted to do something like this when I was in school. 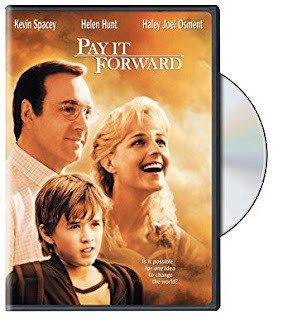 Now a days I always look for ways to "pay it forward" to others around me. I love when I hear stories about people paying it forward. Once again if we were all a little less selfish we would have a much happier world to live in! I love kids movies especially Disney movies because these have many life lessons and moral lessons for kids. As a kid, I also learned a lot from them. However, we should watch kid movies first before recommending them to kids. I remember, as a kid, movies were a great source of inspiration for me. I learned a number of both animated and typical movies. However, my father was very sensitive about this issue. He always watched the entire movie before referring to me and my siblings. These days, due to lots of official and personal responsibilities, I mostly use 123movies to watch free and HD movies at home. Nice Blog! It really sounds good if you love to watch kids movies with your girls that give life lessons. In childhood, my father also advised us to watch movies but with a life lesson. Recently, in summer vacation, I also watched a number of interesting kids movies with my 11 years old son at 123 Movies Free | all123movies.com as we were not able to afford cinema tickets. 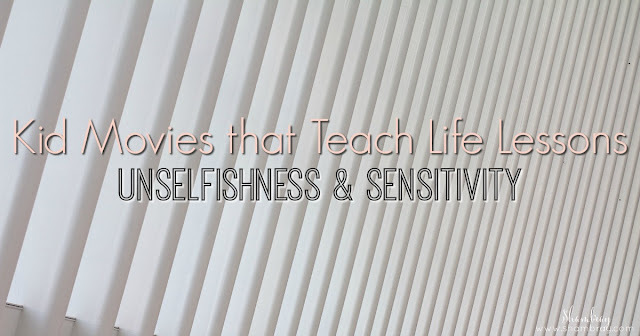 I like to watch movies for kids because those movies are mostly interesting but this blog enhances my interests in these movies because we always watches movies to get some lesson and I would like to watch these movies to get some lessons. In my spare time, I watch movies online on Movie HD and sometimes I go to cinema. Worth reading article! But just want to ask a simple question from you why we don't want to give some lessons to our boys via movies? Why we always want to make our girls responsible compared to boys. My friend who lives in Thailand is a single mom of two boys. She got divorced from husband due to his bad habits. I found this lady as a revolutionary person. She always prefers to watch หนัง ใหม่ ที่ ดู หนัง ออนไลน์ - movie2free.com to make her boys good human being. I pay homage to her courage and attitude to raising kids. Since childhood, I really don't have any interest in movies but my daughter loves to have all the information about upcoming movies, TV shows etc. So, only to be updated with current movies I try to watch movies on m4ufree tv site . Yes, I think movies must teach optimistic lessons. These aren't movie clip or trailers, they are free full-length movies that you can watch beginning to end with perhaps a few commercial interruptions. All genres of upcoming movies can be found as well from comedy to drama from horror to action. There are movies from big-name studios to older or independent movies that many of us love to watch over and over again.